This years film theme was 'Insanity' and was won by Ian J. Simpson with his film Night on the Town. Our judge was Mercury Movie Makers Roy Vickers who kindly came to our club with his wife Jean. 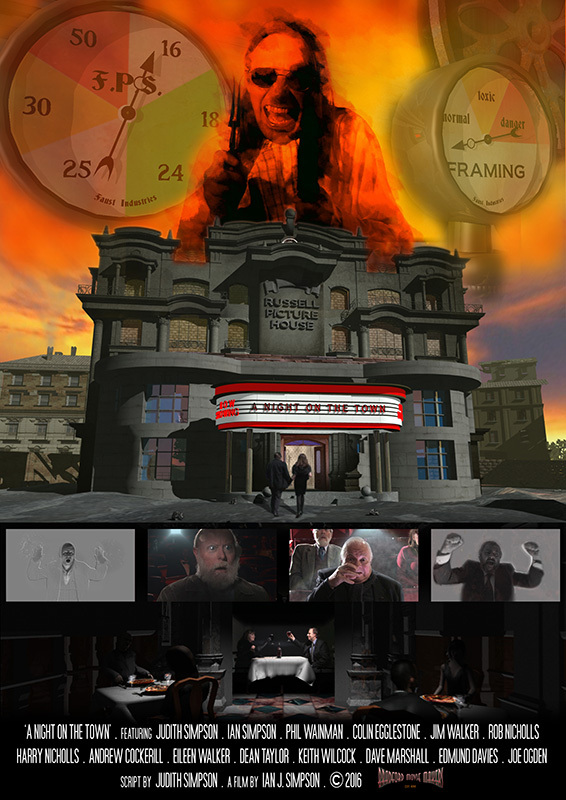 Night on the Town, was written by Judith Simpson with directing and CGI by Ian J. Simpson. Most of the members of the Movie Makers acting in the film. This evening we were visited by film director Oliver Chapman, who was showing us his new film Easy Does It, a comedy about a group of disorganised safe crackers. The film which stared three members of the Bradford Movie Makers, Joe Ogden, Keith Wilcock and Edmund Davies was well received and with Oliver answering questions about the film afterwards. The film also starred Brian Richardson, Mathew Barton and Oliver Chapman himself. Yes, it's that special time of the year again, when members of the Bradford Movie Makers, sit down to a nice meal and find out which Annual Awards they have won. Our judge this year was Huddersfield's Robert Lorrimer (a film maker who has won many awards himself over the years) and a great evening was had by all. Well, the moment we have all been waiting for, when members enter their films in to our Annual Competition, in the hope of winning one of our prestigious prizes, like Best Cinematography, Best Script, Best Visual Effects, etc. All the films were viewed throughout the night and our Judge Bob Lorrimer will be studying them in detail, before announcing the winners at our Annual Dinner on the 11th April. Tonight we had our Holiday film competition, which saw our members submit their films of recent holidays and days out. Our Judge was Bob Rowley, who gave some excellent feedback on the nights films, before choosing Harry Nicholls as the winner with his film of Sowerby Bridge. Unfortunately, this is also the night that we discovered the garage attached to the side the Movie Makers building had previously been burnt to the ground. We had not been at the Movie Makers the week before, so had been slow to discover this news. After a few enquiries, we were told the garage had burnt down because someone had set fire to a stolen car they had parked behind the garage and the fire had spread from there :-o Luckly, the Fire Brigade had managed to put the blaze out before it spread to our main building, something for which, we are extremely grateful.